Calling all Gibson fans who delight in craftmanship and beauty. A gorgeous Les Paul, with elegant appointments, classic warm tones, smoking hot lead tones, elegance, style, grace. This is a monster AAAAA top and back. 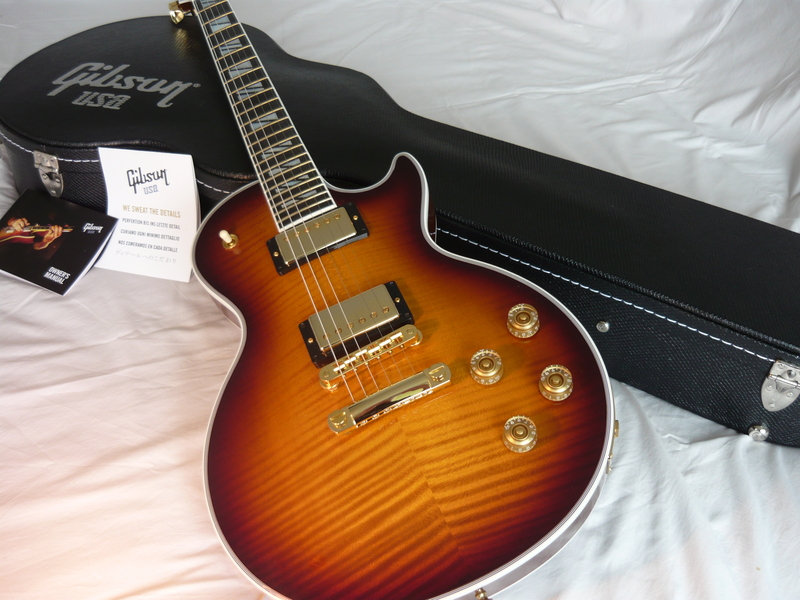 This is definitely a dream guitar for the discerning Gibson lover. Not readily available, has richness and depth, true eye candy. 2012 Les Paul Supreme AAAAA Flametop in Desert Burst... Absolute Monster Top and Back. Weighs in at 8lbs 6oz, new in box, unplayed, 100% mint, genuine made in USA, not a demo in a retail store. Everything about the Gibson Les Paul Supreme Figured Electric Guitar looks distinctive: Custom binding all around; deluxe pearl-on-ebony fingerboard inlays; gold frets; and an abalone, pearl, and brass globe inlaid on the headstock.